Doll birthday cake. Thank goodness for Grandma and her cake-making skills. AWWWWW! Some lucky little one out there will enjoy that cake! What a fun cake! Someone got really lucky :) . Wow! What a GREAT cake! that is awesome!! i wish I had that talet. That is a gorgeous cake! My daughter just flipped out when she saw it! lol! Wow, your mom made that? That's super impressive? My son will be lucky if I make homemade cupcakes this year! AWESOME! 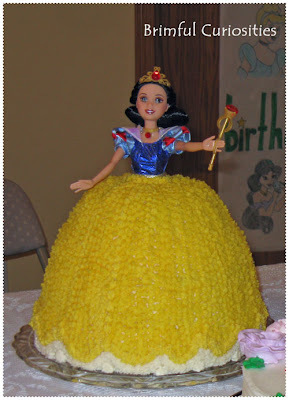 I remember Barbie cakes like this when I was younger, but I haven't seen the princess kind. Happy WW! Wow, that cake is amazing! That awesome! My girls LOVE snow white! That is amazing. I wish I had that talent. You go girl! Beautiful cake! Great job! I had one of those when I was turning 8. Seems like the doll cakes will never die. Wow Grandma's got talent! That is an awesome cake! what a precious cake! I would have loved that as a little girl! That's wonderful! I'm sure someone was very happy to see that! That is one great looking cake. Thank goodness for Grandma indeed. Happy Birthday to your princess! I remember when my mom made one of these. What a beautiful cake! I am sure that was one happy birthday girl! You are so lucky to have a decorating Grandma in the family. My DD had a cake like that one year for Barbie and it was some major $$. Happy WW! Wow! My daughter would absolutely love that cake. I wish I had that kind of skill. Every girl deserves a cake like that for her birthday! we all did I bet. I think mine was pink and I was so excited to show all my friends. Wow! Gotta love a doll cake!